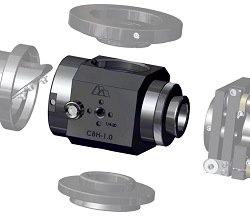 A SET of interchangeable modules and accessories to enable users to customise an optical microscope from any major manufacturer has been launched by Siskiyou. The modular system is based around the CBH-1.0 cube beamsplitter, which sits in the infinity space of a conventional microscope. The beamsplitter opens access in two orthogonal axes perpendicular to the tube, allowing a range of other optomechanical modules to be attached. Available accessories include a self-registering slide assembly that allows a 45deg beamsplitter or mirror to be inserted or removed from the tube, without disruption to the optical path. Alternatively, a second camera can be attached to the microscope, just below the trinocular assembly. The module also allows any fibre-delivered laser or other light source to be directed or scanned anywhere in the field of view. Siskiyou also offers an interchangeable objective assembly, which it says delivers superior opto-mechanical registration and alignment to standard objective turrets. The company says that microscopes from all manufacturers, including Zeiss, Nikon, and Olympus, can be customised this way. The modules enable a conventional fluorescence microscope to be configured for sophisticated imaging applications at a lower cost than a dedicated instrument. In particular, they provide a simple means of combining wide field imaging with local fluorescence excitation and probing, in applications from optogenetics to photosynthesis studies.